I took this quite some time ago. The book was lying on my desk, I don’t remember the specific reason I needed it at the time. I thought I’d also prepare the instructions for this critter – they are quite easy and yield this nice lizard/dinosaur thingy. When I first created this fold, I thought it was quite an achievement to make it with four legs. In any case, it came out a very nice image. 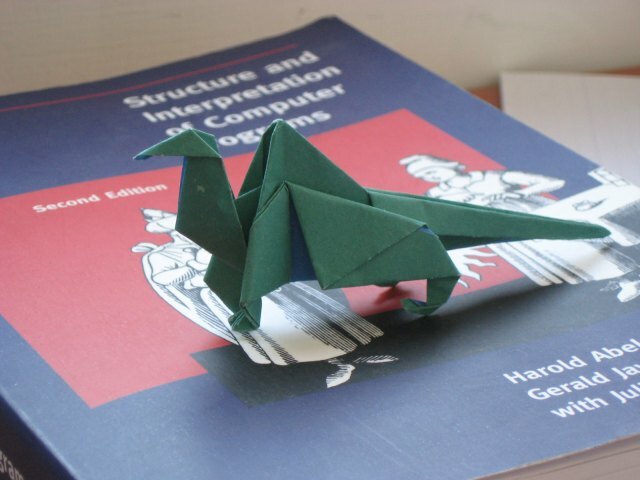 I find it amusing that in the book I’m currently reading, there are mentions of computational origami as a prerequisite of transcendence. This entry was posted in Origami and tagged book, lizard, Origami. Bookmark the permalink.